AnimagiC has a reputation for having so much interesting programs that it is inevitable to miss some of them, there are always overlaps in the time table. For that reason, others and me have created a personal time table to work out the optimal constellation of concerts, panels and signings. Unchanged from last year the caterer provided drinks and food exclusively and all bottles had to be disposed at the entrance. Apart from that the venue was very friendly and well-suited for such an event. With two main halls for concerts and large events, several rooms for panels and a foyer on all three floors the Rosengarten provided space for the manifold of activities the visitors could took part in. 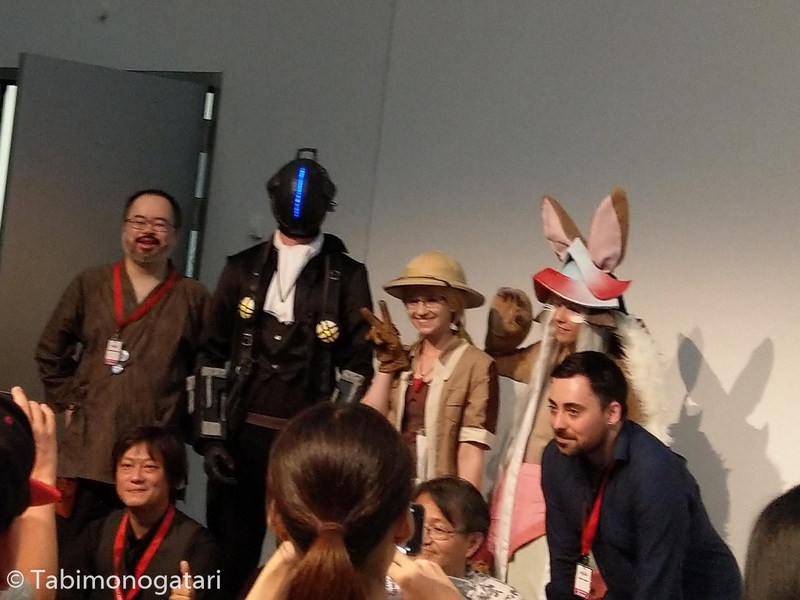 Several high-profile guests from Japan were invited, this being one of the biggest selling points of this convention. Since the list is considerably long, I will only mention a few people I interacted with during the event. The full list can be found here. The guests are grouped by the anime for that they collaborated together and were announced with. The convention opened at 2 pm but allowed the visitors to pick up their entry bracelet beforehand. 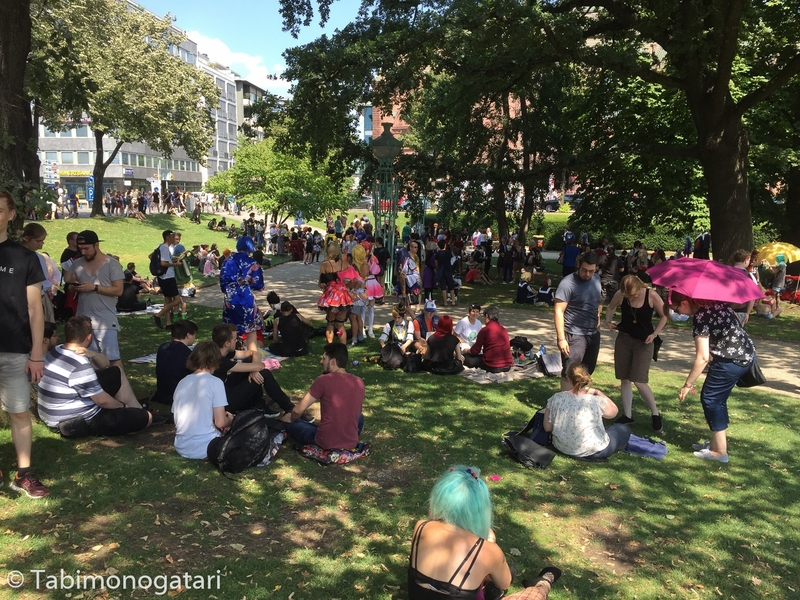 The sun was shining intensely on the attendees waiting patiently in line and many cosplayers must have had a hard time under such harsh conditions. 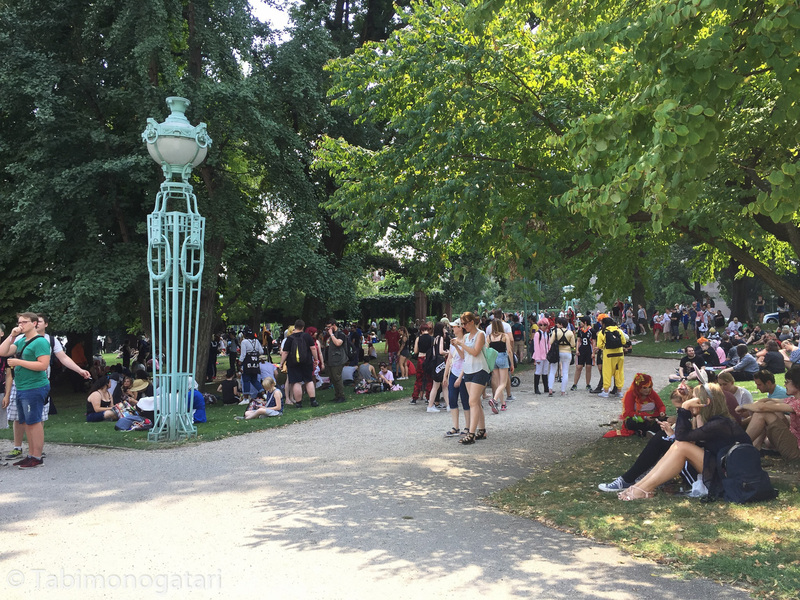 Nonetheless, many enthusiastic cosplayers with beautifully crafted costumes were present in the garden surrounding the iconic Wasserturm and inside. 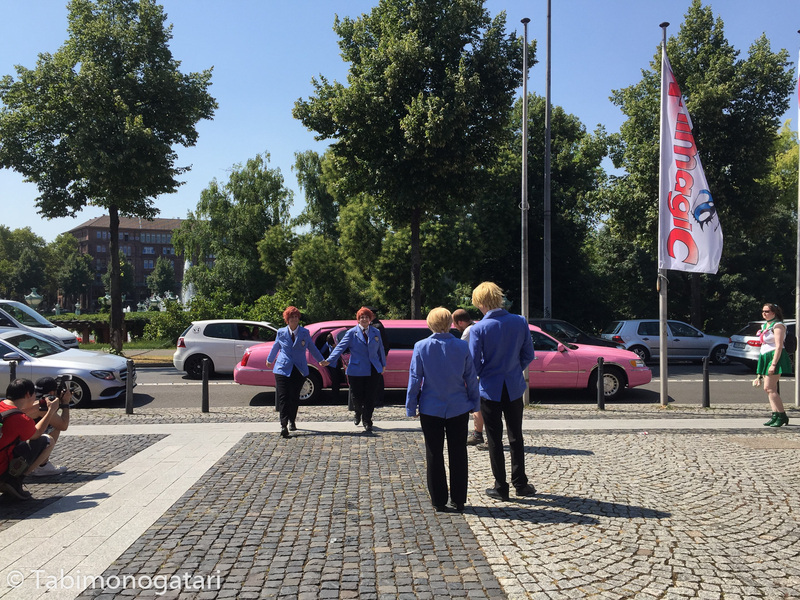 While I was waiting for the opening, a pink limousine stopped in front of the building and out came a cosplay group that went the extra mile to put up a show. 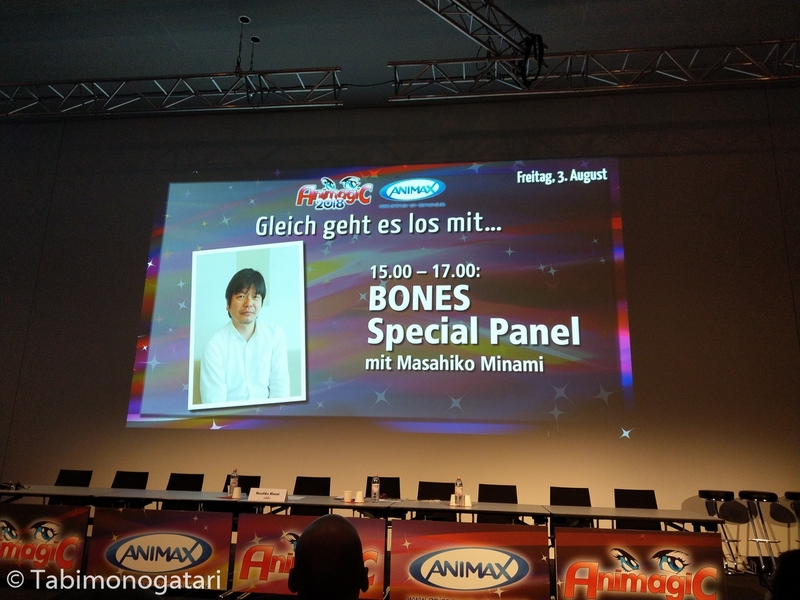 My day started with the Studio Bones panel, led by Masahiko Minami, the head of the studio. At the beginning the first episode of the most recent production “Hisone to Masotan” was screened. The anime was about a young woman in the JSDF (Japanese self-defense forces) who was reassigned into a secret division which deploys a real dragon disguised as a fighter jet for missions. Then, a compilation video embodying the 60 works the studio produced this far was shown. The audience clapped whenever they liked a title, and there were only a handful of titles which were not well-known to the audience. The most popular shows were Fullmetal Alchemist, Cowboy Bebop and the recent Boku no Hero Academia. Minami then showed several trailers of the upcoming works, including movies to Bungou Stray Dogs and Eureka Seven. In the Q&A session he hinted at a continuation of Boku no Hero Academia and confirmed that for the second season of Mob Psycho 100 they will again recruit top industry talents regardless of the financial burden this costs. A question was asked about the collaboration with Netflix, and Minami answered this strategic partnership allowed them to fund more original projects not based on a successful medium. Lastly, several animated key frames of “Sword of the Stranger” were presented. 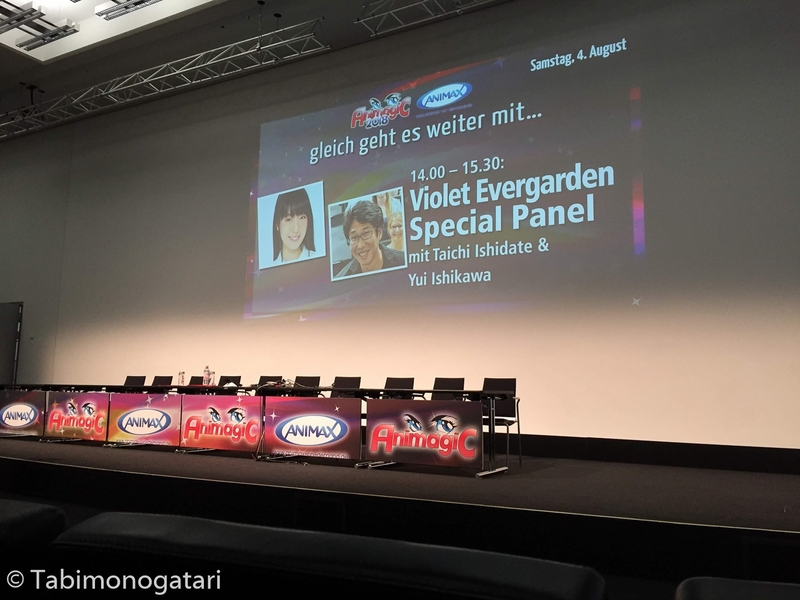 After this interesting panel I entered the queue for the two guests representing Violet Evergarden, the director Taichi Ishidate and the voice actress of the protagonist Yui Ishikawa. The publisher Universum hosted the two and presold the first volume of the anime localized in German. Luckily, I could get both a volume and a shikishi signed from both of them. 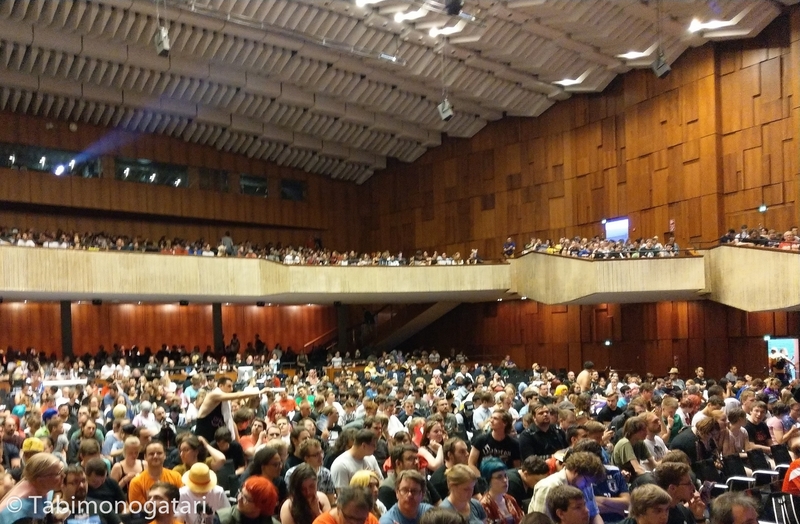 In the evening the opening ceremony took place where also the AnimaniA awards are presented every year, this year for the 13th time. Eligible were works that are licensed in the German market. For dinner we went with two friends who came all the way from the Netherlands to visit the convention. Actually, we got to know each other two years ago at this very event. Just one street down we enjoyed sushi at the restaurant Kaoru. 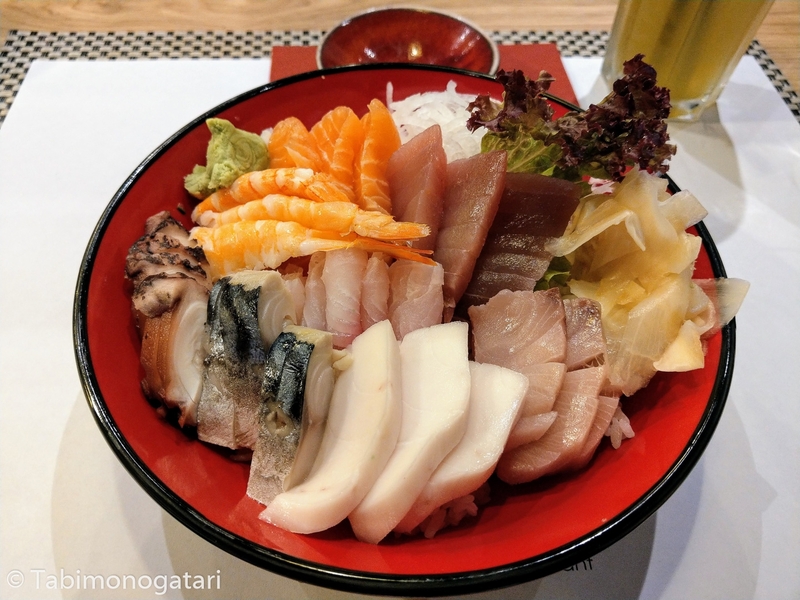 The chirashi was a great choice and had such a variety of delicious seafood to offer. After the meal we returned to see the concert of Zwei and Konomi Suzuki (in this order) who both performed last year as well. They had a good mix of original and anime songs and the audience seemed very pleased with that. More and more fans acquired penlights which elevated the concert experience, although some did not pay respect to the tempo or mood of the individual songs. Dedicated fans created a so-called callbook that outlined how to cheer and interact with the artist during the concert. It also contained the lyrics of the songs and the image color for penlights. Tired but still eager to experience more, I attended the screening of the prequel film No Game No Life Zero. The director Atsuko Ishizuka was also present and greeted the fans at the beginning. Amusingly, the film borrowed some German phrases for spells and names, since it must have sounded cool to them. The film finished at midnight and I hurried home to catch enough sleep for the next busy day. The venue was opened on time and the visitors could enter without much of a wait, dispersed and reassembled into queues for several events. I noticed that it was nearly impossible to receive some event tickets since they were limited to a small number and they were sold out by the time everyone standing in line was inside. This problem is hard to solve, although other booths opted for a draw-of-luck type to make it fairer for everyone. 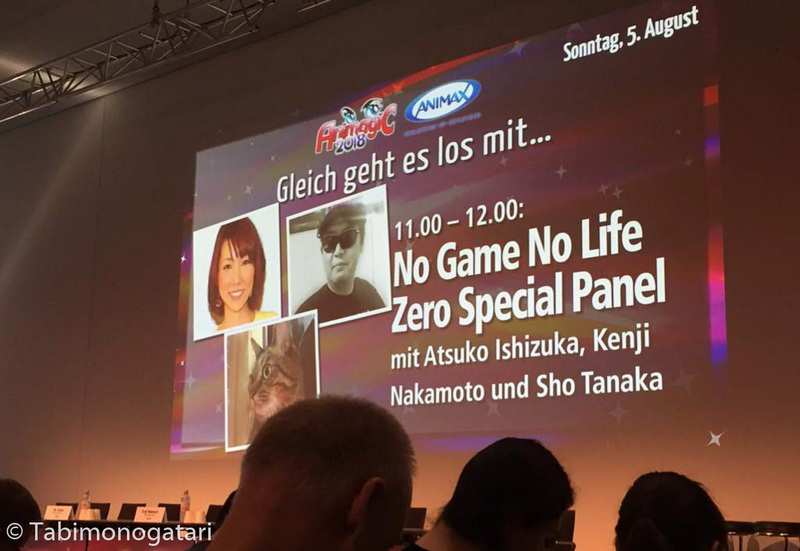 The first item on my agenda was the No Game No Life Zero panel with the director Atsuko Ishizuka and the producers Nakamoto and Tanaka. The panel consisted mainly of a Q&A session and in the end some goods were given away to true fans who could answer several hard questions. Most questions went to Ishizuka, to example she was asked how she arrived at her current profession. She answered that she was not focused on an anime career at the beginning but liked to draw. The two producers, one from Studio Madhouse and one from the publisher Kadokawa, explained what their involvement in the project was and how they both represented their interests. It was asked how much influence the light novel author had on the film and what the favorite characters of the team were (Jibril for Ishizuka). Some questions revolved around Ishizuka’s newest work, the series “Sora yori mo tooi basho”, an anime about a journey to Antarctica. She conceived the original work by thinking about how she can convey a coming-of-age story with the topic of embarking on a journey to self-discovery. She chose Antarctica as the setting since it was a place she and many others had never been. Not all questions were easy to answer, to example a fan asked when the No Game no Life series will be continued, somebody else noted the poor sales of the series in Japan compared to Germany. As a joke the producer said they would produce series for the German market from now on. As the panel ended I made my way to the ground floor and got into the line for the two Made in Abyss signing sessions. Unfortunately, both the mangaka and the anime team held the sessions at overlapping times at different booths and they were opposite to each other, but I was able to visit both in time. To mark the occasion, I ordered a tapestry from Japan and asked for autographs of the whole team. The management of Tsukushi-sensei did not permit to sign the item which was a bit sad. Returning upstairs, the Violet Evergarden panel was about to start where a new extra episode was screened, followed by a Q&A session. Both Ishidate and Ishikawa were present for the whole panel. Ishidate showcased the first episode ahead of the official broadcast in Japan last year in this room. Last time he was accompanied by True, the artist who performed the opening and the insert songs in the extra episode. After the moving episode finished screening, several questions were asked, like how difficult it was to come up with the lyrics for the opera song lyrics in the production. Ishidate said it was very difficult, as it was for the characters in the episode. Later he refrained from saying anything regarding a possible sequel. Violet’s voice actress was asked how to deal with the varying emotional expression of her character over time, keeping in mind that the extra episode plays in the first half of the story line. Another interesting question was how and by whom the decision of greenlighting a sequel to a project is made. Ishidate replied to the question which European country served as inspiration for the fictional country that there was no specific one. 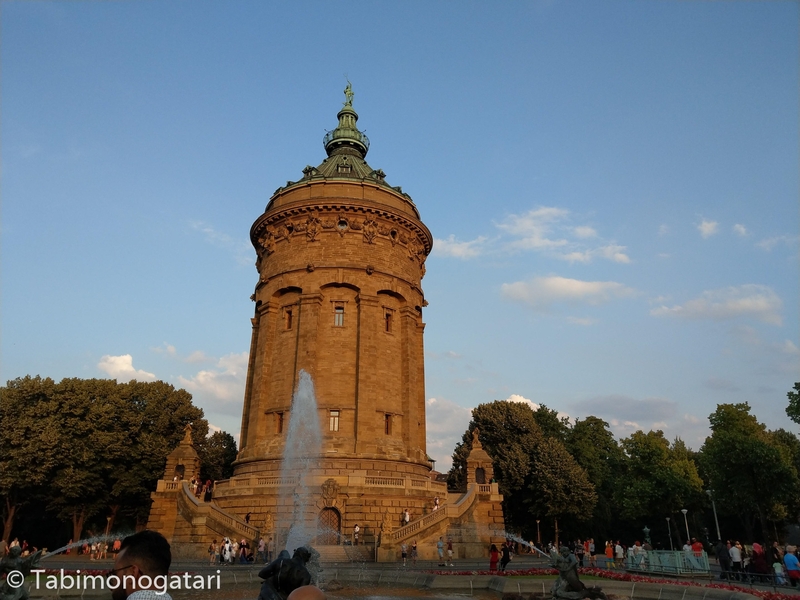 However, he added that after seeing the landscape of Germany, and especially Mannheim, he wanted to include this as inspiration for the future. 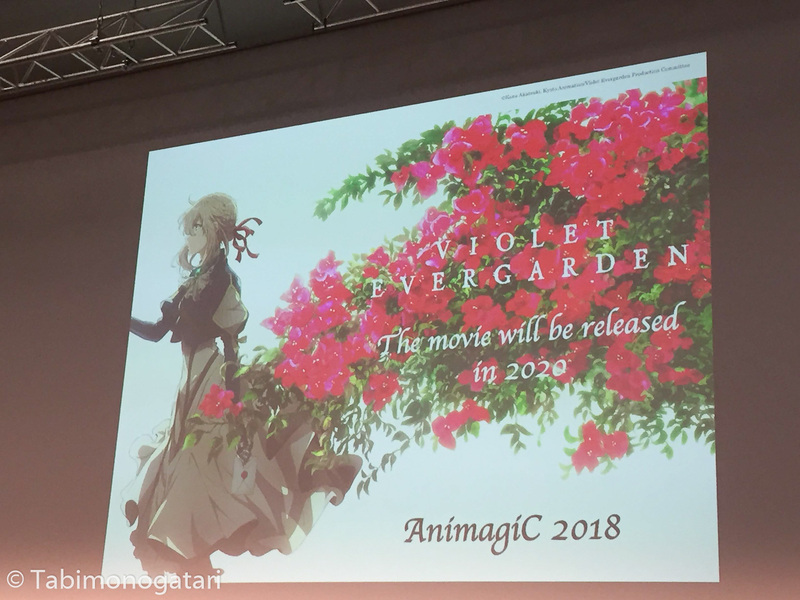 A previously published trailer was then presented announcing a movie sequel of Violet Evergarden slated for 2020. Also this time five shikishi with hand drawn illustrations by Ishidate himself were gifted to winners in a lucky draw game. The third panel I attended this day was about the manga and anime adaption of Made in Abyss boasting an outstanding lineup of five guests: The creator of the manga Akihito Tsukushi, as well as the anime’s director Masayuki Kojima, producer Shimpei Yamashita, art director Osamu Masuyama and composer Kevin Penkin. The first episode was screened with German dub, then the Q&A session was opened. The staff commented the high quality of the dub and even though they did not understand the dialogue they noted that the German voice lines fitted the speaking animations perfectly. Tsukushi revealed that in the early stage, he had combined the two main characters Riko and Reg into one. To the question of how it was decided to make the anime Yamashita replied he made the decision the day he read the second manga volume. He was so convinced of the story that after checking that no other company was already producing it he immediately sealed the deal. Tsukushi was also regularly part of the production committee and acted more as a supervisor than giving detailed instructions. In fact, the anime staff asked many detailed questions about the world that he had to find an answer to himself. Drawing from these inspirations he was able to further expand his world as he drew new chapters. When asked what the most challenging thing during production was, he replied everything was a challenge. Art director Masuyama explained his role in the project, supervising the art department and giving instructions of how to make the world look compelling and real. The audience asked Penkin how he joined the project as a foreigner to produce the soundtrack and he explained that he worked with the studio Kinema Citrus before. When composing, he took the background art and the movements of the animated characters into consideration. At the time Tsukushi watched the final anime for the first time he was deeply moved he said. Towards the end Penkin was asked about his favorite track to which he almost replied with a major spoiler to the plot in the second half. The staff prepared a giveaway as well, three lucky winners were determined by a draw of luck and could take exclusive merchandise home. The mangaka was so happy to see fans cosplay his characters, so he took plenty of pictures with them. The first concert of the day I attended was starring Mika Kobayashi and the samurai sword performance group Kamui. Although it seemed like a strange combination, the artists supported each other during the performance, to example Kobayashi provided a backdrop to the sword performance of Kamui. Kobayashi became famous for her strong voice in the soundtracks of Hiroyuki Sawano, who composed the music to several popular anime such as Attack on Titan and Guilty Crown. Right after the concert of the band Eufonius took place, who are well known for their music for the Key/Visual Arts games, such as Clannad. It was surprising to see them on the program this year, since they were celebrating much higher popularity some years ago. Hearing their songs life felt incredible nostalgic and brought back memories of the great anime and visual novels that used the songs. 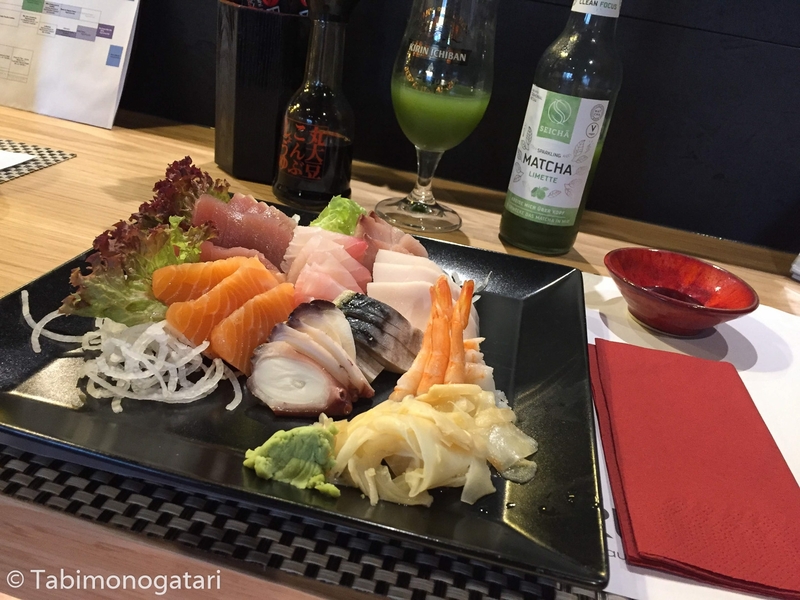 After the long day I joined a large group of hungry attendees and we enjoyed a delicious meal at Senju in the city center. 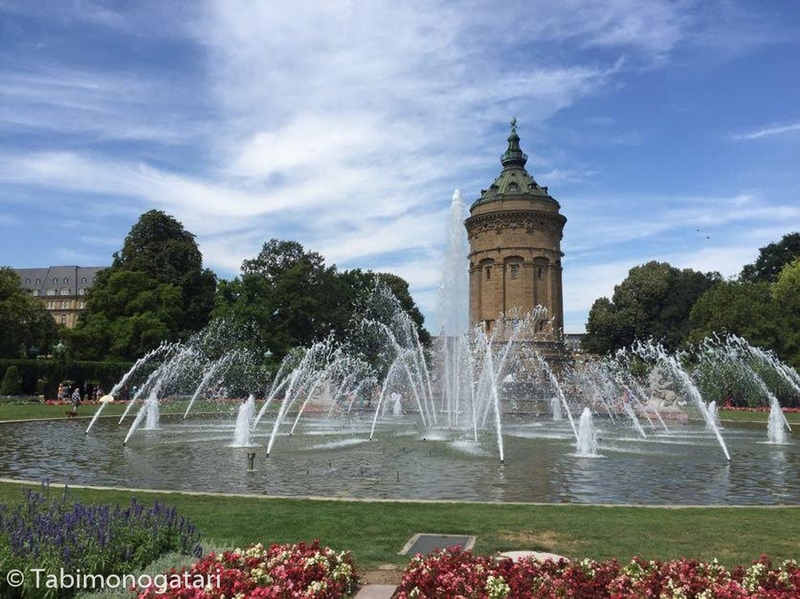 The restaurant was only recently opened but quickly rose to my personal favorite in Mannheim due to their authenticity, both in décor and cuisine. Not much different to the two days before, I entered the venue at 10 o’clock and started queuing for an event or signing session, Since I missed the first signing session of Konomi Suzuki and Zwei on Saturday evening, I was happy to meet them after queuing for 1.5 hours. The queue was organized and even sported a end-of-line sign, but some active queue management would be encouraged, given the small space in front of the signing rooms. All the merchandise of the artists sold out during the session, therefore I was quite happy that I ordered a CD to sign in advance. 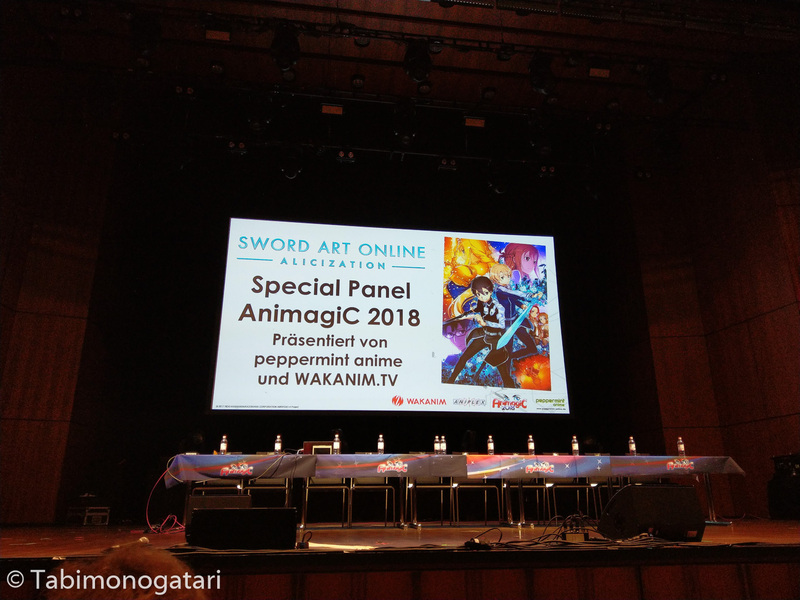 The next event for me was the Sword Art Online panel hosted by the publisher peppermint anime. Quite remarkably, they asked for questions before the actual panel started and checked whether they made sense to ask in this context. To example, asking a question to a guest about a different work of his was not permitted. Also, they picked two volunteers for a later segment who were given a dialog script. Then, the guests of honor of the SAO project entered the stage. On the one hand, there was the author of the light novels, Reki Kawahara, the illustrator abec and the editor of the light novels, on the other there were the producer of the anime and two voice actors from the German dub. After playing a video compiling the events of the anime this far and teasering the newest season slated for fall, a Q&A session took place. abec meanwhile drew a character portrait in the meantime. Comments about the author constantly missing deadlines and doing so on purpose to prevent major revisions to the manuscript were well received. The editor explained that in the short time frame of a month from the submission of the initial manuscript and the printing revisions to former and illustrations have to be done. Everyone agreed the time was very limited, but they are happy with the product nonetheless. In another segment the German voice actors and the two volunteers acted out two scenes from the recent movie. At the end of the panel abec finished his drawing just in time to a large round of applause. When I arrived in the smaller of the two big halls the concert of Mika Kobayashi had already started. Like on Saturday she performed together with the samurai sword actor group Kamui, at times singing her own songs and a times providing a backdrop for their sword performance. The concert hall was filled to the last seat, but the short 45 minutes for both artists combined was a bit short in my opinion. On the other hand, this gave me enough time to return to the Mozartsaal where the final concert of Konomi Suzuki and Zwei took place. Suzuki’s setlist was similar to the one of her first concert and the crowd was very excited again. During one ballade she asked the audience to wave their smartphone torches like a lighter which resulted in a great atmosphere. She finished with “This Game”, and many fans sang the refrain with her. It was the best of the view. The iPhone lights are beautiful! Soon after Zwei rocked the stage with their energetic performance. They began with some of their original songs and then continued with songs from the anime Steins;Gate and Robotic;Note. Suddenly the band began to play a somewhat familiar melody which turned out to be the classic German song “Mamor Stein und Eisen bricht”. Together with the roaring audience they sang the song completely in German. During one song the vocalist Megu left the stage and walked and sang through the whole concert hall. When she returned she threw her fan with a German and a Japanese cover on each face into the excited crowd at the front. The closing event took place thereafter, but I could not take part in it because I needed to leave for Switzerland. The next edition will take place on August 2 to 4, 2019, most likely staying in Mannheim. I look forward to next year and will surely be back for the program-rich convention.